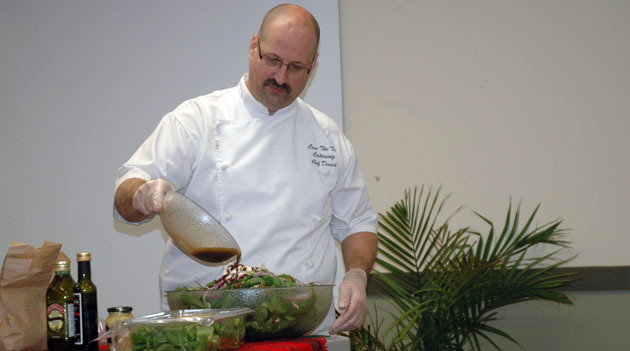 Chef David Bensmiller pours home-made vinaigrette on his spinach salad at the Be Well at Work event. 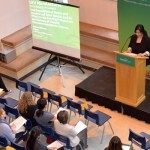 UFV is currently partnering with the University of British Columbia’s School of Population and Public Health and the Canadian Cancer Society in the Be Well at Work project. Many employees are helping gather data by participating in Be Well at Work questionnaires. The project held a fall food tasting event at the University of the Fraser Valley. The event included a cooking demonstration and tasting to celebrate employees’ participation in Be Well at Work. The project focus is on decreasing employees’ cancer risk through increasing fruit and vegetable consumption, boosting physical activity and maintaining a healthy body weight. UFV employees have had the opportunity to participate in the Canadian Cancer Society British Columbia and Yukon’s new comprehensive workplace wellness program, WellnessWorks. On Dec 1, chef David Bensmiller, a UFV Culinary Arts instructor and owner of Over The Top Catering, demonstrated his approach to healthy cooking and provided samples to Be Well at Work program participants at the Fall Food Tasting event. After completing the program questionnaire, all Be Well at Work participants at the University of the Fraser Valley will be eligible to win a $50 gift certificate to Paliotti’s Italian Restaurant. Being healthy at work is more important than ever. In 2004, Health Canada reported that 67% of adults spend more than 60% of their time at the worksite. The workplace has become a key location to encourage healthy practices and to reduce cancer risk — one-third of all cancer cases can be averted through appropriate diet, physical activity and weight control. Dr. Carolyn Gotay is the project’s principal investigator. She is a Professor in the Faculty of Medicine at the University of British Columbia, and she holds the Canadian Cancer Society Chair in Cancer Primary Prevention.